Some years ago I was involved in budget evaluation for one of the town’s school districts. I was asked to extend a budget analysis I did back then to include recent data. I’d take it back farther, but I don’t have older data. First thing first. Data comes from the numbers reported by the state. Scroll down to “Valuations, Property Tax Assessments, and School Tax Rates.” I made one tiny change when updating this set of data in that previously I called 2000-2001 data FY2001 while I recognized that the state just indicates it to be from 2000. So the dates are back shifted by 1 year in these updates to be consistent with how the state reported the numbers. Constant dollar calculations come from Consumer Price Index data from the US Bureau of Labor Statistics. 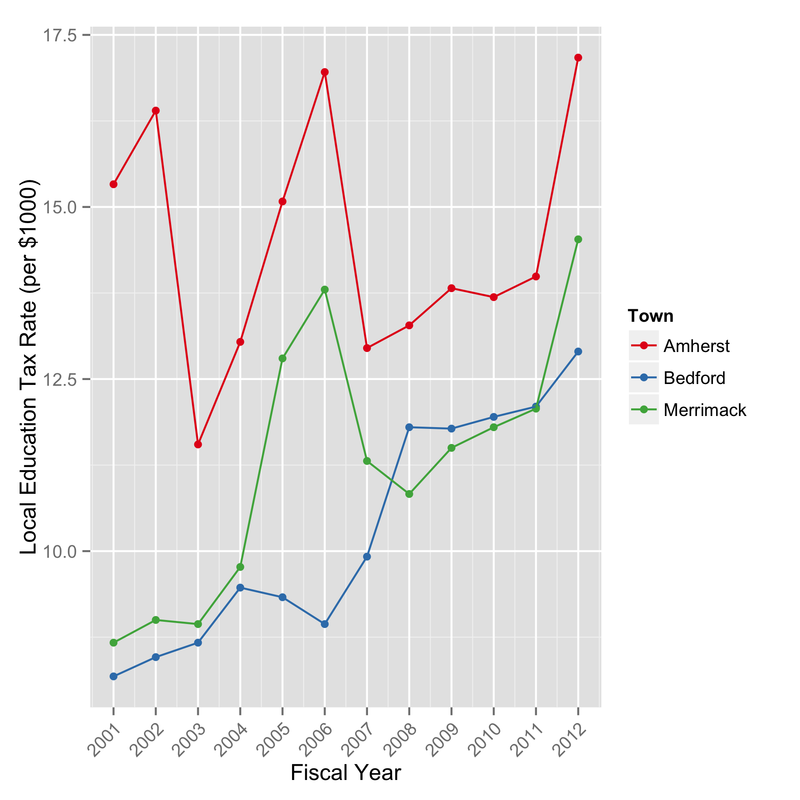 First, total property taxes for Amherst, Bedford, and Merrimack from 2000 to 2016. These are actual dollars. Let’s examine the fractional growth in the budget from 2000. This makes it easier to compare growth figures. Not quite double in 16 years for us. Same thing, but in constant 2000 dollars. Here’s how Amherst property tax rates break down. The fluctuations mean less because the total property value of the town (Net Assessed Value) changes over time (see last graph). But this is how the mil rates compare over time. Since education makes up most of it, let’s just extract that number for Amherst, Bedford, and Merrimack. This is the local education tax liability. Here’s the growth chart (plotted is the multiplier). And in constant 2000 dollars. This basically says we in Amherst have had flat education spending (changing pretty much with inflation only) since 2005. The Net Assessed Value (total taxable property value) for all three towns. One of the questions I was asked after yesterday’s post on property tax growth was on how inflation factors into the picture. My original intent was to measure the actual change in property tax bills, but it is instructive to add the inflation perspective. There are a handful of inflation rate calculators available online that will let you make adjustments for constant dollars. Since my property tax information starts in FY 2001, I’ll use constant 2001 dollars here. Inflation essentially measures the change in buying power of a currency over time. That is, if something cost $1 in 2001, because of inflation it will cost a few cents more in 2002, and so on. You’re probably already made the observation that things cost more at the store, this is generally due to inflation. How it impacts you depends on whether your income has kept pace with inflation or not. 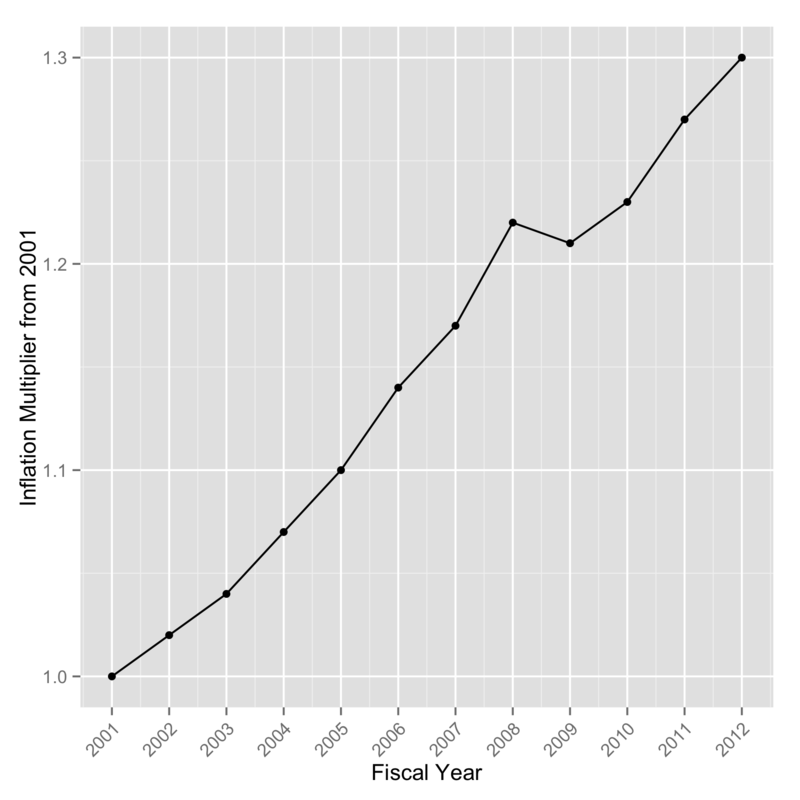 The easiest way to look at this is to put together a table of multipliers for each year, referenced to 2001 (graphed below). This will allow us to recalculate the tax data from yesterday in terms of constant 2001 dollars. Inflation multipliers to determine constant 2001 dollars in US currency. The overall effect of taking inflation into account, particularly when it is increasing as we see above, is to shrink the value of the dollars being spent in time. What it allows us to see is whether the changes in the numbers come from changes in the value of the dollar, or whether actual spending has changed. Given what we know about health insurance costs in our school district, we should not be surprised to see that actual spending increases here. Last time I broke out the education dollars for the towns that were raised by local property taxes and we looked at how they changed over time. Below is that information replotted in constant 2001 dollars. Amherst has a growth factor of about 1.7, Bedford hits 2.4, and Merrimack 2.2. Locally raised education spending by town in constant 2001 dollars. Likewise, here is the total property tax growth of the towns in constant 2001 dollars. Again, very similar to yesterday’s plot. Amherst comes in at a real growth factor of just under 1.4, Bedford at 1.7, and Merrimack at just over 1.4. Changes in the total property tax burdens of Amherst, Bedford, and Merrimack in constant 2001 dollars. One of the issues that I hear often in talking with people in town is about how much our taxes in Amherst have gone up in recent years. So it made sense to me to dig deeper into this issue to better understand what has been taking place and put some numbers on it. Lucky enough, the information that we’re after is collected by the state and made available online. The tax rate graph for Amherst below shows that the largest property tax impact in our town budget comes from the cost of operating our schools. This is not uncommon in New Hampshire where we’re largely on the hook for costs of what we do in our towns. Since they are the biggest piece of the tax pie and since I’m chairing the Ways and Means committee for the Amherst School District this year, let’s start with education taxes. Amherst tax rates by fiscal year. Before we get too far into what these numbers mean, I think it makes sense to put our numbers in perspective, so I gathered information for Bedford and Merrimack as well as for Amherst. Interestingly, the state does not split the Amherst School District and Amherst’s share of the Souhegan Cooperative School District apart, so the Amherst numbers that we will go over here are our complete numbers for the town’s education costs. So let’s start by looking at local education property tax rates. Below are the mil rates (tax rate per $1000 of property valuation) for education in the three towns since fiscal year 2001. Note that the rates jump all over the place, particularly for Amherst. This requires some explanation. Local tax rates for Amherst, Bedford, and Merrimack. There’s a very good, but slightly odd, reason for these jumpy numbers. This tax rate is calculated by first determining the amount of money that needs to be raised from the budget and then dividing that number into the total value of taxable property in town. Take away a factor of 1000 and you get your mil rate. Now every few years the town pays for an assessment of property in the town. Either the people who do the assessments have some interesting formulas or the towns do a very poor job of estimating property values between valuations, because we see some pretty big jumps in the total value of taxable property in town. Whenever you see a big change in valuation, the tax rate changes in the opposite direction (that is, when they consider that your house is much more valuable than it was the year before, your tax rate goes down, and vice versa). The graph below shows the total assessed value of taxable property in each town by fiscal year. I find it somewhat odd that property has increased in assessed value in spite of the real estate market downturn, but this doesn’t really affect your taxes, only the tax rate you pay, which as you saw above, is constantly adjusted to raise exactly the budgeted funds. 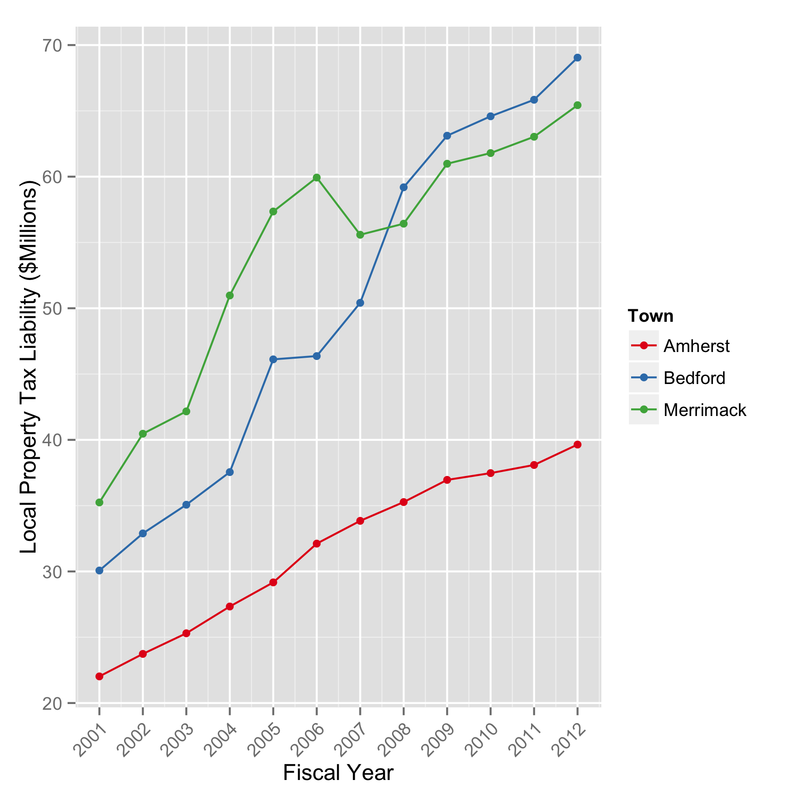 Total property assessment by year for Amherst, Bedford, and Merrimack. Now “budgeted funds” is the key term here, and combining the information in two graphs above lets us come up with the total amount of property tax money each town raises to cover their local education budgets. And this is the information that we need to understand how people’s actual local tax bills are changing over time. Remember that the amount raised by property taxes is the number that is left over after subtracting any state and/or federal money from the school budgets that we vote on in March. I have graphed these numbers below for clarity. When it comes to Bedford’s numbers, it can be useful to recall that they opened their new high school in 2007. Taxpayer raised local education dollars for Amherst, Bedford, and Merrimack. With all this in mind, we now can calculate, on average, how much our education property taxes have gone up with respect to FY 2001 numbers. For Amherst, the answer is they have increased, on average, by a factor of 2.2 (as of FY 2012), and we are the lowest of the three towns. The graph below has the details. 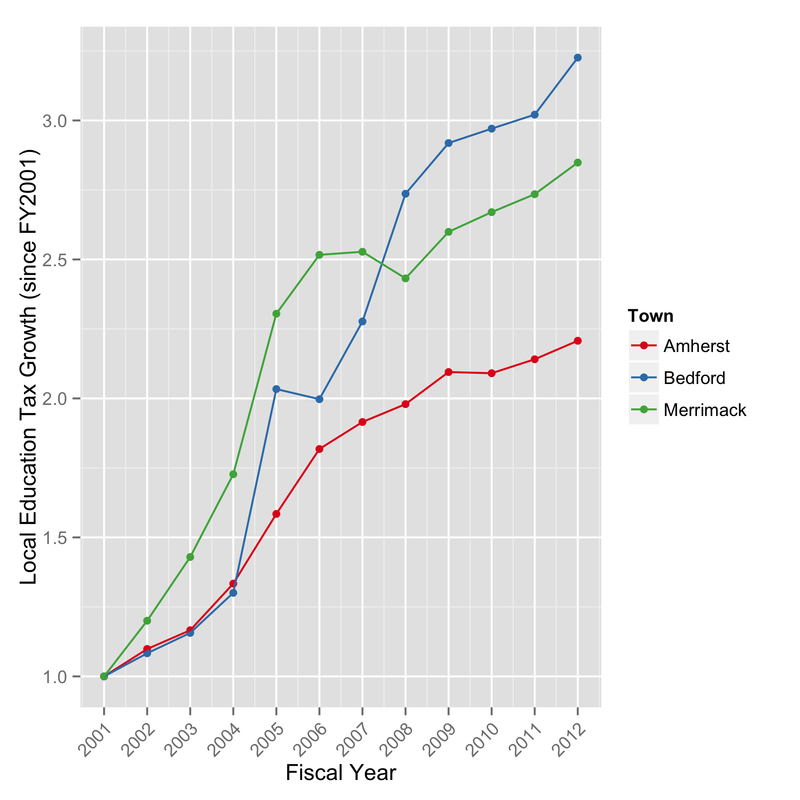 Growth in the total locally raised education spending, referenced to FY 2011 for Amherst, Bedford, and Milford. While this shows the bulk of the spending in each town, it doesn’t tell the whole tax burden story. What about everything else included in property taxes? It is easiest to just look at the total tax burden. We don’t really need to look at the rates, since a decrease in the rate doesn’t necessarily mean a decrease in spending. So below is the total property tax burden for each town, which includes the local education numbers from above, but also the state property taxes, and other town and county spending for Amherst, Bedford, and Merrimack. Total tax liability for Amherst, Bedford, and Merrimack. To put numbers on growth, we can normalize these to 2001 as we did before with the education budgets. It is interesting to see that Merrimack’s growth is reasonably close to ours, with a few years of exceptions. Compared to the other towns, Amherst looks fiscally responsible. 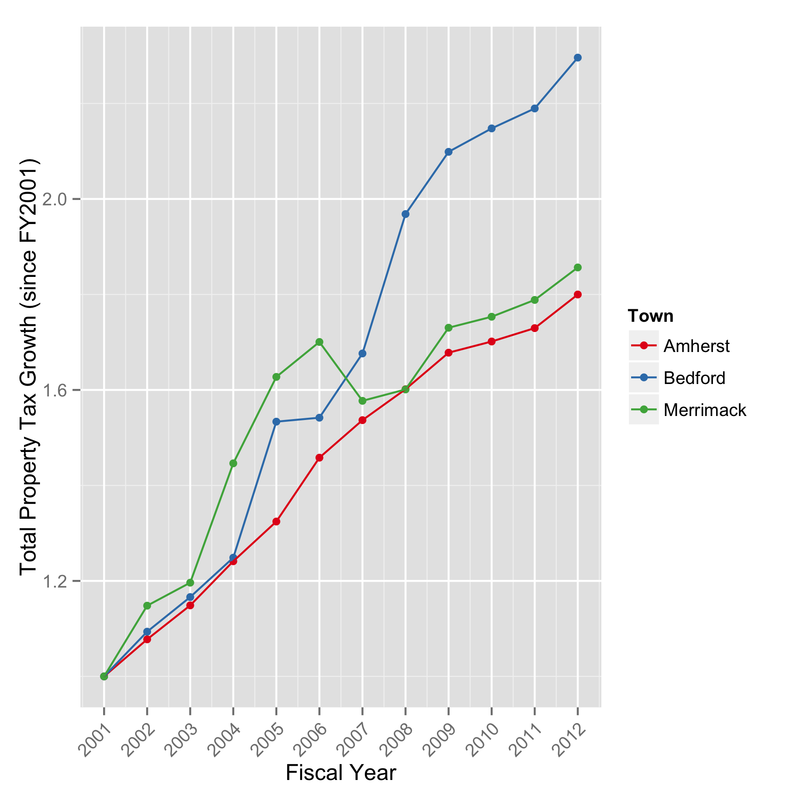 Growth in the total tax liability for Amherst, Bedford, and Merrimack. So now we have the answer that we set out to find. 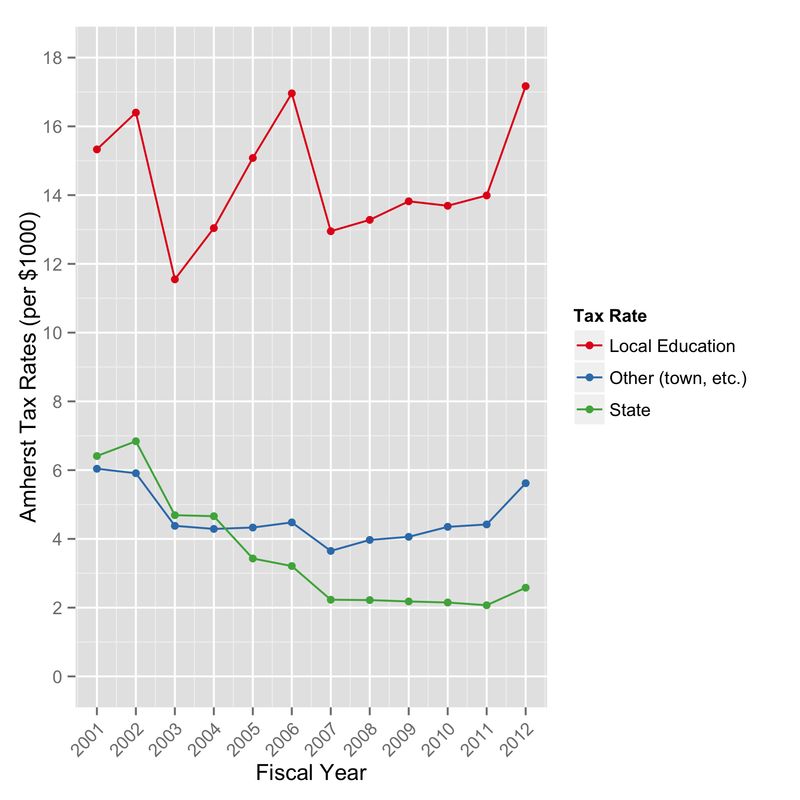 Although our actual school tax rates have more than doubled, our total tax burden in Amherst has, on average, increased by a slightly smaller factor of about 1.8 since FY2001. Note that this is averaged over the whole town and how this impacts your household tax bill has much to do with how your property’s valuation has changed compared to the rest of the town.